I thought that maybe some of you would like to take part in my Grand Opening Party. So here it is. A contest. Whoever has the most original/amusing/entertaining guess as to what the crap this thing is will win. What will you win, you ask? Well, If you are a knitter and not a spinner I have some Alpaca With A Twist in two different weights. We shall discuss. If you are a spinner I will send you 8 ounces of some fabulous fiber. Again, we shall discuss. Here is a better view from the top. See there’s a hole drilled in the side of the bowl. Why would anyone buy this? My Ma! She loves me. 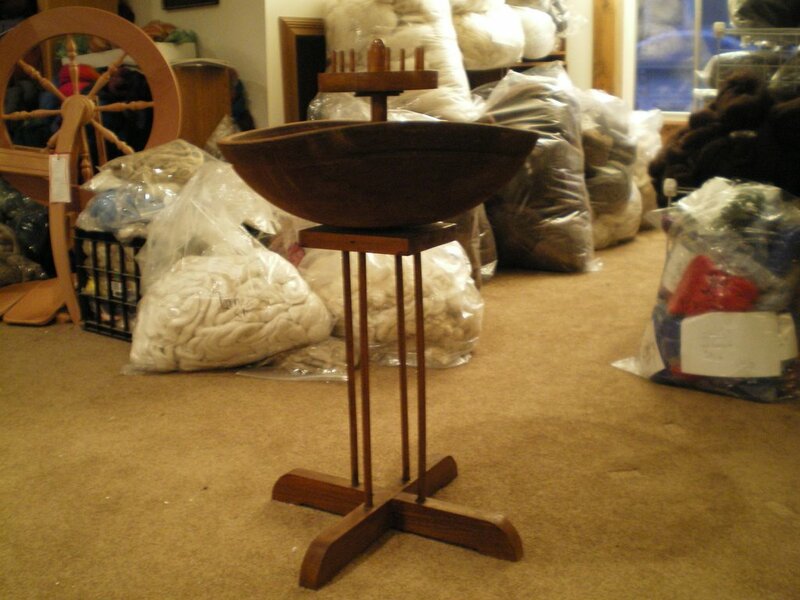 After this weekend is over I will be using it to display some handspun yarns in the shop. Speaking of the shop…Looky what I got today. It’s the new Kromski Sonata. It folds almost flat and goes into that green bag. I love the look of it. 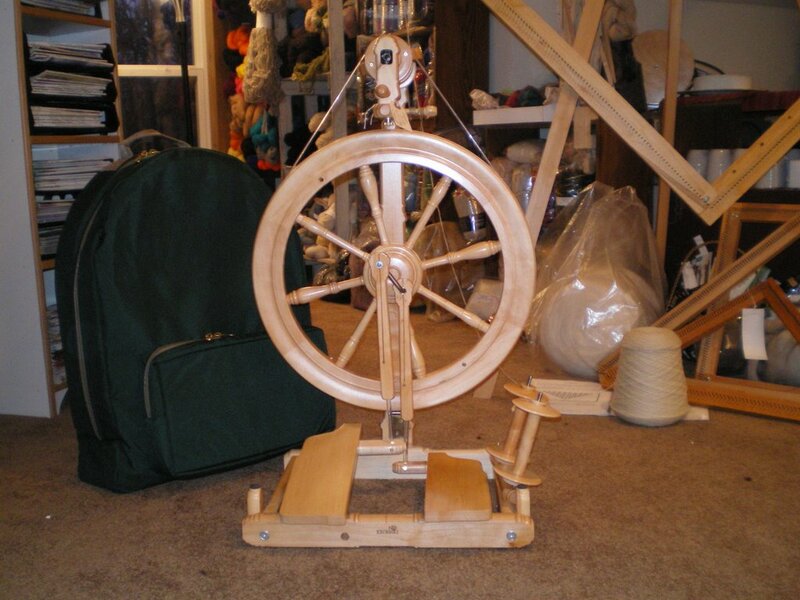 It’s a little more noisy than I like in a spinning wheel but maybe it just needs to get broken in. It spins very well though. It has 3 drive ratios and is easily adjusted. Retail price with the bag is $580 if I remember correctly. The Kromski sure is cute though. I think I need to spin on it a little more. Well, tomorrow is the big day so I’d better be getting my rest. I’m hoping for a big day and I’m scared that I won’t be able to handle it. So many mixed feelings of hopefulness and nervousness. Good luck tomorrow! It all looks very exciting. I’m guessing that that contraption has something to do with flax and that the bowl holds water that drains out at the hole. I bet Dave at the Merlin Tree would know (or do you?). Hope you have/had a great day at the store today. It’s very exciting to read about. I’m guessing it’s a homemade pasta bowl/hanger. 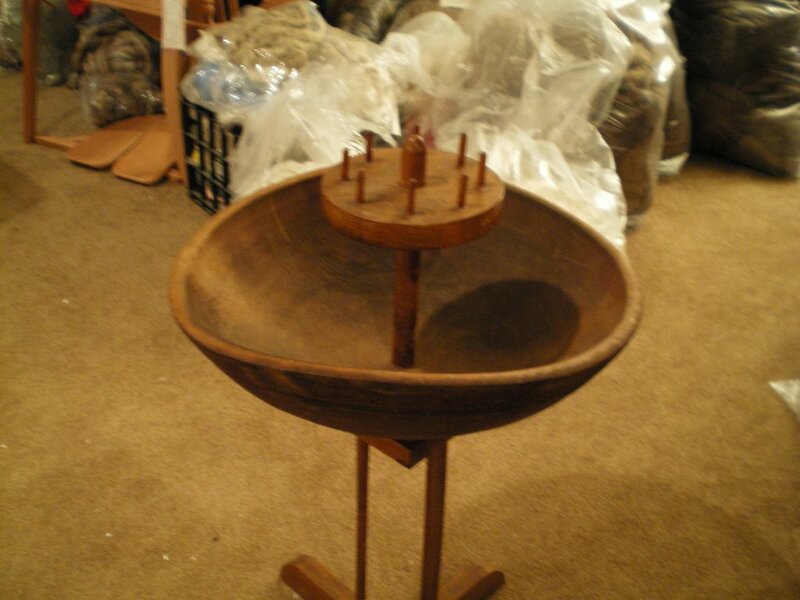 You mix the pasta in the bowl and hang it to dry from dowels in the center. The hole is there in case you want to thread your spaghetti out of the bowl in one very long string and wrap it in a very large ball. I hope you’re having a fantastic Opening Day! Although I really like Hesira’s idea, my guess is: giant pom-pom maker. Fully automated. The bowl part is a fuzz-trap for the little bits of fuzz that fly out when you make giant pom-poms that fast. That’s my story, and I’m stickin’ to it. 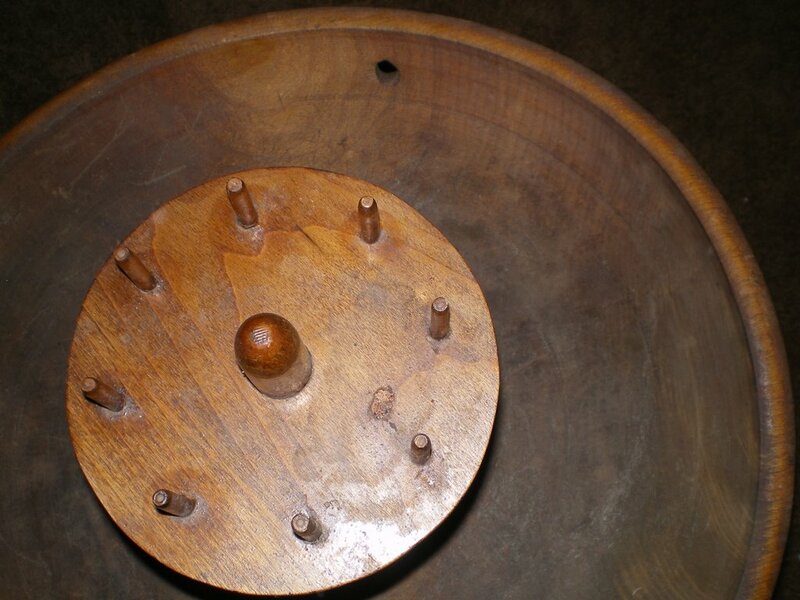 Hubbster has his own guess (for which I take no responsibility whatsoever) – he suggests that candles are supposed to be stuck on the thingies on top, and water in the bowl – a prayer-o-matic for some ancient and now extinct religious sect. If you spin the bowl fast enough, the water rises, squirts out the hole, and – instant baptism! Like I said – I take no responsibility for this whatsoever. (But I would take his prize if he won one). As per my guess at the shop- I am convinced that this is a prototype hands free corn on the cob feeder for families of 8 messy children…. each peg holds one cob of corn, each one buttered, then children take their places around the bowl. Messy drips and lost kernals drop into the bowl… Snap! No more messy corn fests! congratulations- you’re doing a terrific job! Yes, I was going to say a spaghetti bowl, which winds off individual servings from the communal bowl…. I hope you had a wonderful party, I only wish that I could have come. Actually, if you ever find out what it really is, please blog about it. I’m die-ing to know.